Weyfringe can supply a vast range of different label types to cover almost any labelling requirement. If you have a specific labelling requirement and require assistance in correctly specifying labels for your need please contact us and we will be happy to help. Direct thermal labels do not use a ribbon. Instead the label surface is coated with a heat reactive layer which turns black when in contact with the heat from the printhead. This heat reactive surface will effectively cause the print to fade when exposed to sunlight, strong artificial light or indeed friction (cartons rubbing together in transit for instance) with the speed of fading dependent upon the intensity of the light or friction. For this reason direct thermal labels tend to be used for short shelf life products such as fresh food. Although there are no ribbon costs associated with direct thermal labels there are others cost increases involved as without the ribbon acting as a protective insulator between the printhead and the label, the printhead will wear more quickly requiring more frequent replacement. There are many types of face material available with the end use being of particular importance to your choice. Paper is the most common label material, due to its wide range of applications from warehouse and carton labelling to product and food labelling. Direct Thermal Paper labels are largely matt finish and can be uncoated or have a thermo-reactive top coat. Thermal Transfer paper labels come in different finishes from matt to gloss. All Weyfringe stock labels are machine coated semi-gloss for clear, legible print. Synthetic labels can be supplied in a number of colours and even transparent depending on the synthetic material. 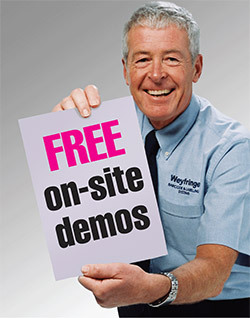 Weyfringe use a strong permanent adhesive with an operating temperature range of -20°C to +70°C on our stock labels. Suitable for most applications, providing good adhesion, meaning our labels can be used for everything from product labels including barcodes to shipping and storage labels. It is important to minimise toxicity risks when labelling food and adhesive products used in food labelling are tested for BfR compliance. The BfR is the optimal European regulation and is accepted across the European Community. Weyfringe standard adhesive has been given BfR approval for direct contact with dry and moist non-fatty foods, and is ISEGA and FDA approved. Peelable adhesive (low tack) can be useful when labelling a product directly to enable the end user to remove the label easily, leaving little or no residue. Our peelable adhesive has a broad adhesion temperature range of -30°C to +70°C. The low tack adhesive is also approved for direct contact with dry and moist non-fatty foods under the same regulations as our standard label adhesive. Our deep freeze adhesive has an ISEGA food contact approval and an operating temperature range of -40°C - +80°C designed to be used in environments where strong adhesion is required at low application temperatures. This type of permanent adhesive offers a strong initial grab to the application surfaces, and is commonly used to label difficult, rough or dirty surfaces such as vehicle tyres or corroded metal. This adhesive has also been approved by the research centre ISEGA, according to European requirements EU10/2011, for use in labelling of food packaging materials. In addition it may be used for direct contact with dry, non-fatty foodstuffs. Specialist adhesives for extreme or mission critical applications are also available. Examples include haz-chem, waterproof and pharmaceutical labels. These special grade adhesives have been designed to meet very stringent standards. They can have very extreme operational windows making them ideal for very specific requirements. 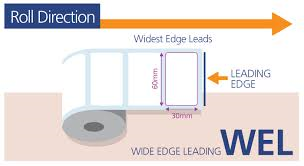 Wide edge leading means the longest edge of the label will always be first off the roll. Similar to landscape orientation. Narrow edge leading means the shortest edge of the label will always be first off the roll. Similar to portrait orientation.